The whereabouts of Ukrainian President Yanukovich are unknown a day after he agreed to opposition demands. Parliament is trying to replace its resigned speaker to push for presidential resignation and an early election. Ukraine remains chaotic amid the worst political crisis the country has seen in modern history. Viktor Yanukovich has gone missing, with even his immediate staff declining to say where he is. 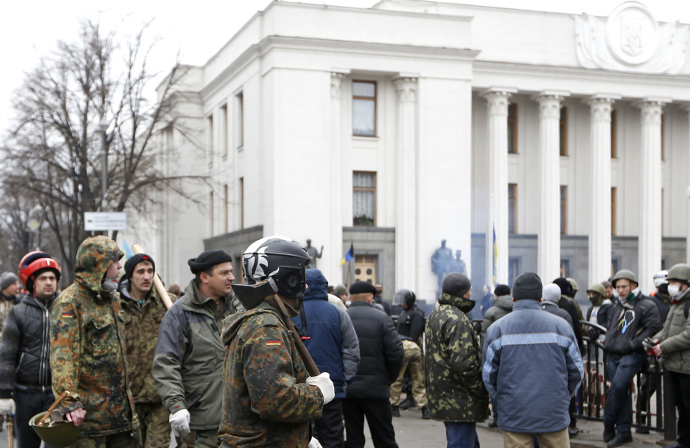 The presidential residence in Kiev has been abandoned and left virtually unguarded. Some media reports said on Friday that the residents had packed up and left. Some media reports suggest that Yanukovich is in Kharkov, a city in Eastern Ukraine, which is a stronghold of his Party of Regions. The president is supposedly going to take part in a summit of members of regional parliaments from Eastern and Southern Ukraine. The emergency gathering will be discussing the ongoing crisis and the strategy the Euromaidan-skeptical regions will follow after the opposition gains in Kiev and in the west of the country. Neither presidential staff nor local authorities in Kharkov confirmed Yanukovich’s visit. The local airport said the presidential plane had not landed there. Meanwhile in Kiev, the Ukrainian Parliament gathered for a new emergency session. The session started with an announcement that Speaker Vladimir Rybak and First Deputy Speaker Igor Kaletnik have both resigned. The Party of Regions faction in the parliament lost eight more members on Saturday, as MPs rushed to abandon the sinking ruling coalition. Over the past few days, a total of 34 parliamentarians announced they were parting ways with Yanukovich’s government. Opposition parties are pushing for adoption of a resolution demanding that Yanukovich resigns the office of the president. If he submits, Ukraine would have to hold early an presidential election by May 25. Due to the president’s absence, the bills passed by the parliament on Friday have not been passed into law from a technical point of view, because Yanukovich never signed them. Opposition leader, Arseny Yatsenyuk, told fellow MPs that this gives grounds for the president’s resignation. The bills, previously agreed to by the president and opposition leaders, include a constitutional reform, which strips the presidential office of a lot of power in favor of the parliament, forming a national unity government and holding early parliamentary election.